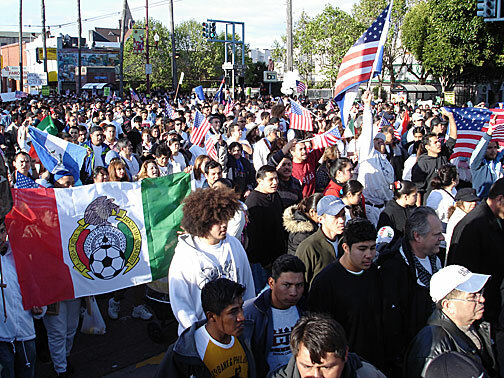 The politicized Latino community of the Mission District continues to act on its own behalf in the neighborhood's public spaces, as seen in this April 10, 2006 Immigrant Rights March that drew over 10,000. Club Elegante, 3395 Mission St. (now Club Malibu) In 1989, police and INS raided Club Elegante, a Latino club in the Mission. That night, police and INS officials detained more than a hundred clients and employees at the Club. Patricia Aguayo, currently the executive director of MECA, was at Club Elegante the night of the raid. The following account reflects Aguayo's experience that night, although it is also representative of the experiences of many of the patrons at the club that night. Aguayo's experience is somewhat different however, in that she is a U.S. citizen and was nonetheless detained by police and INS officials. 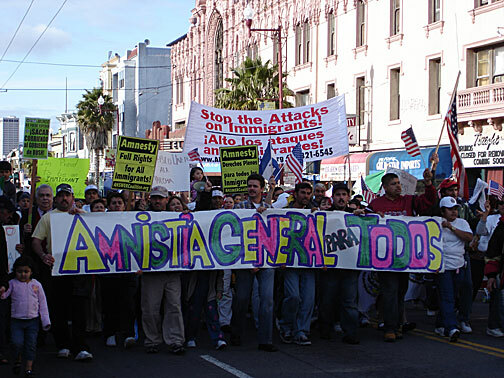 This action portrays racist attitudes that classify all Latinos as undocumented immigrants. As the police entered the club, INS officials wearing US immigration jackets also entered the building. One INS agent went up to the stage and announced that they were conducting a raid and that no one was to leave the building. The police had blocked all exits. People were terrified as police asked people, one by one, for identification. This apparently lasted a few hours and everyone, undocumented immigrants and citizens alike, were forcibly detained during the entire time. Soon after, everyone was taken outside and placed against the wall. According to Aguayo, people were treated like criminals. Men and women alike were handcuffed and police tightened the cuffs brutally, especially on the men. Furthermore, the police were verbally abusive. 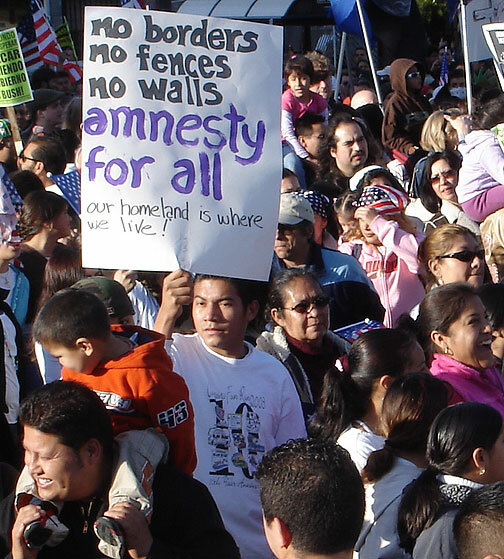 Although U.S. citizens and legal residents were detained for a long time they were not taken into custody. Unfortunately, the undocumented immigrants who were detained were deported that very night. This incident led to the strengthening of the city's sanctuary ordinance, which forbids the cooperation of local law enforcement with the INS.